Is there anything better than a grand weekend breakfast? Actually yes there is! A HEALTHY grand weekend breakfast! 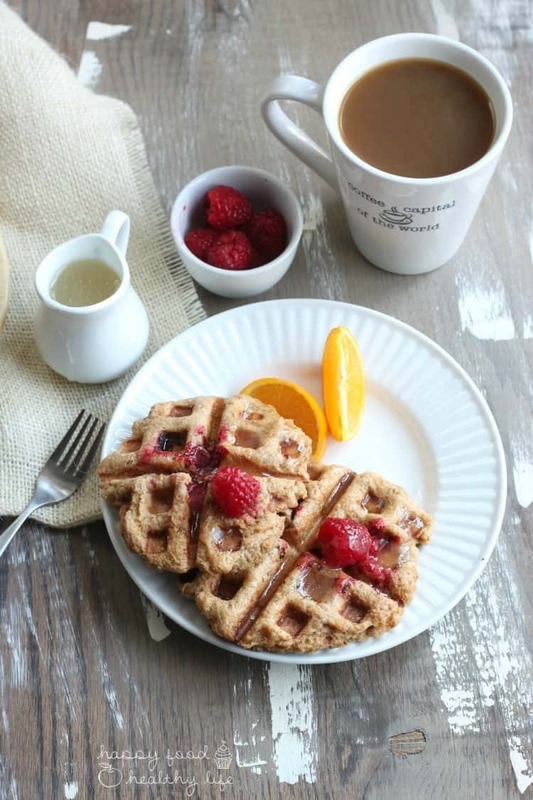 This Whole Wheat Raspberry Liege Waffle recipe is sure to kick your weekend breakfast up a notch! So we talked about breakfast on Monday with my Healthy Peanut Butter Cup Overnight Oats. Easiest recipe ever that comes together in under 60 seconds and tastes like dessert. 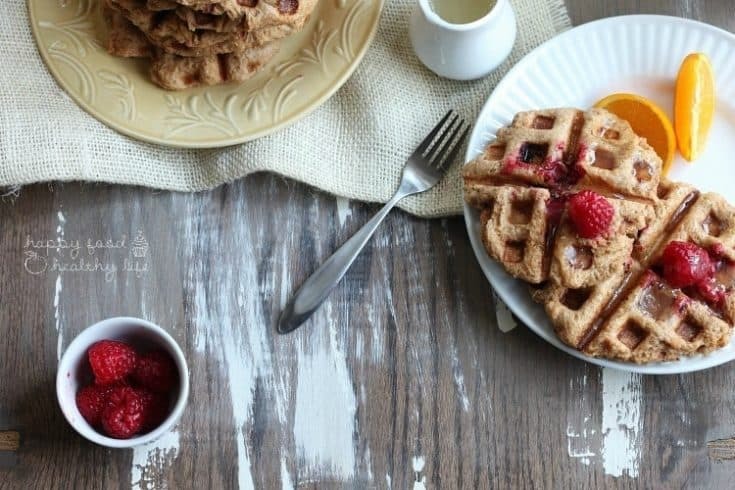 And while this gorgeous waffle recipe that I brought today tastes ridiculously delightful, this is definitely one that’s meant for the weekend. After you’ve slept in and had a couple cups of coffee. Definitely not a rushed morning. In fact, let’s just say this one’s for brunch. Heck, an Easter brunch with these light, yet hearty, waffles stacked high on a plate would be quite the treat! I just love waffles. Those mini squares have a wonderful purpose. They are meant to hold sweet toppings and syrups in each little pocket. I remember, as a kid, my brother and I used to make sure there was butter and syrup in each and every little square. Of course, to ensure flavor in every bite. Back then though, we were eating toaster-waffles. From the freezer to the toaster, doctored up with too much syrup, and into my mouth. My taste buds and have grown up quite a bit, and my waffles have followed suit. So I usually prepare a yeasty waffle that caramelizes around the edges from the little gems of sugar I’ve mixed into the dough after it’s risen. 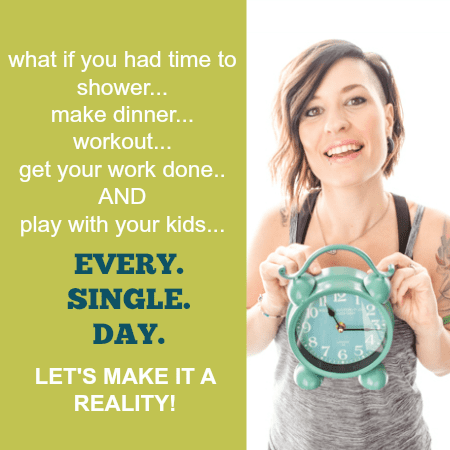 You guys, I know this one takes a little more time and effort, but it’s so totally worth it! With Spring on the horizon, I knew I had to play with berries in this recipe. Berries and of course lemon. This lemon syrup is absolutely to die for! Even if you only make the syrup and pour it on pancakes that you make from a boxed-mix, you’ve got to give the syrup a shot. It’s insanely fresh and tasty. 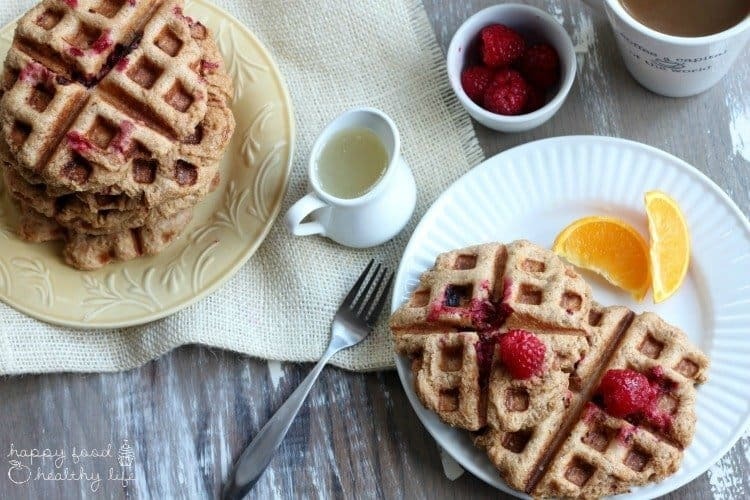 The perfect combination with the berries and the whole wheat waffles. Divide into 8 individual baseball sized balls, top each with 3-4 raspberries, and let rest about 15 minutes. Prepare the syrup: place milk, coconut oil, and sugar in a medium saucepan. Stir on medium heat until sugar dissolves and butter melts completely. At that point, bring mixture to a boil for 1 minute, stirring constantly. Remove from heat and add baking soda and lemon extract, and continue to stir constantly. The syrup may foam up a bit, so be prepared to hold the pan over the sink while stirring in case it foams over. Stretch the ball of dough out a bit and place it on the waffle iron so it covers the majority of it. Gently close the waffle iron and flip per the manufacturers instructions. To serve, top with a couple fresh raspberries and lemon syrup. Today is actually Waffle Day! You know, another one of those silly food holidays that I can’t help but celebrate. 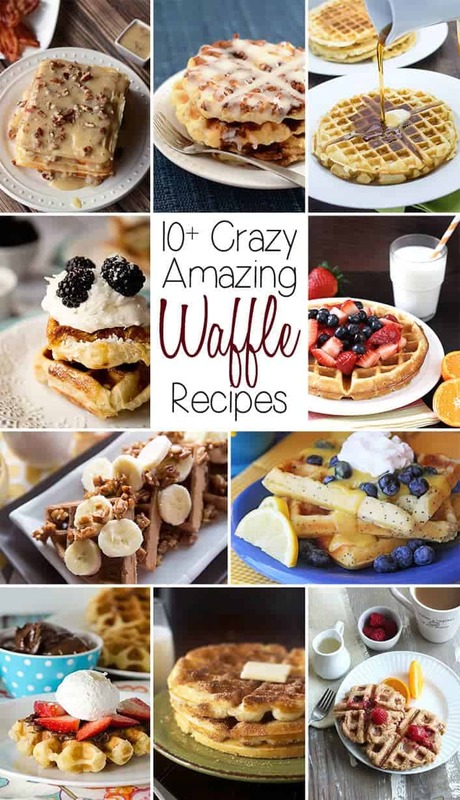 I even got together with my favorite foodie friends so we could all bring you our favorite waffle recipes together in one spot. Check out what waffles my friends made! 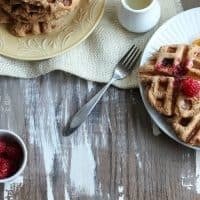 Lemon Poppyseed Waffles w/ Lemon Butter Syrup – Jamie Cooks it Up! Yum, yum, yum Holly these look awesome! Whole wheat?! YES!! I love raspberry and lemon together, so these sound delicious! I can’t wait till our raspberries come on. I’ll be giving these a try. Mmm… I’ve got to try these! 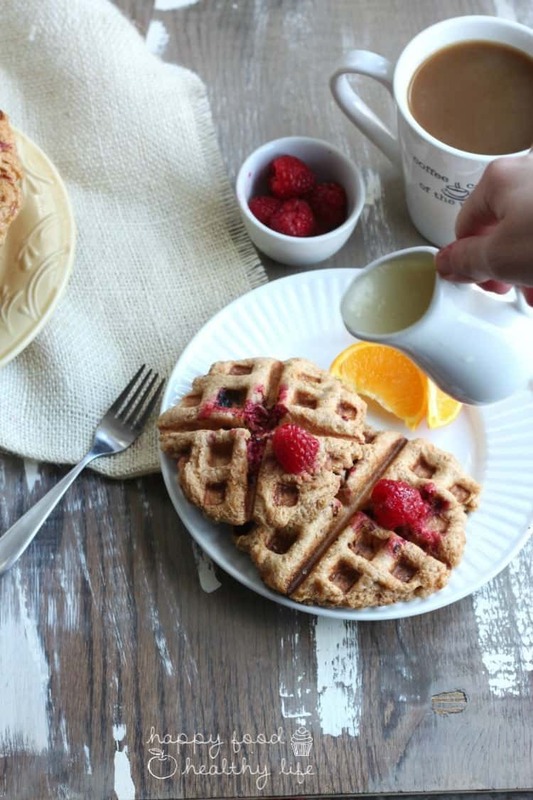 I’m another fan of lemon and raspberry- and the liege waffles look delicious!